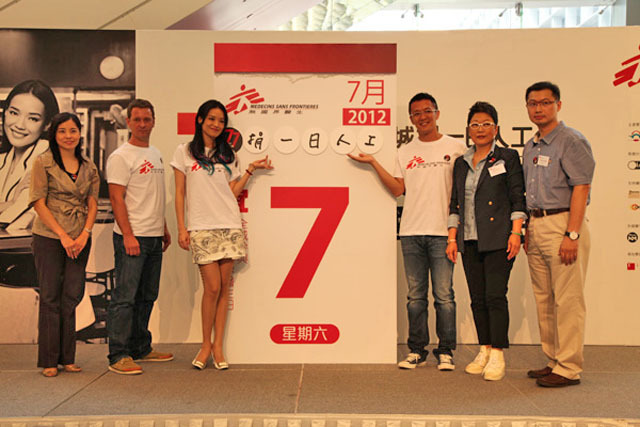 Shu Qi donned a Médecins Sans Frontières/Doctors Without Borders T-shirt to help publicize their Hong Kong action day on 7/7. The pitch from MSF asks interested individuals to support its worldwide humanitarian work by donating a day’s income. Hello Kitty, the Honorary Student Ambassador, didn't make an appearance at the event but those who made a one-off donation at Hong Kong 7-11 stores got a badge with the cute cat's image. Citizens of Hong Kong have the same relationship with MSF as does most the First World: the organization recruits volunteer health care personnel--mainly doctors, nurses and logistics experts--and raises money from the SAR. MSF was active in Hong Kong before they set up a fundraising and recruitment office though: they ran medical facilities for Vietnamese refugees in camps in Sham Shui Po, Tuen Mun and Pillar Point from 1988 until everyone was resettled or repatriated ten years later. While the government of the PRC is sensitive about the presence of foreign medical workers in China, MSF has been able to provide services to those living with HIV/AIDS in Guangxi and Hubei in collaboration with Chinese public health authorities. The delightfully named Kubrick Beijing, a coffee house dedicated to film director Stanley Kubrick, will be the venue for a photo exhibition, film showing and book launch highlighting the international humanitarian relief projects of MSF. It kicks off on July 13 and runs until August 5. Shu Qi with an appropriately somber mien while contemplating the work she is supporting.